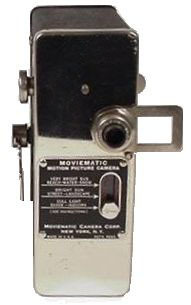 The Moviematic Standard was produced in 1937. It was advertised as a 3-in-1 All Purpose Automatic camera. Infact it produced 16mm movies, single exposure snapshots and flip-book exposures. The camera is equipped with a lens Ilex Achromatic. The camera has three adjustments on the front: "Very bright sun, Bright sun and Dull Light. The camera measures 48x138x107 mm.